As continuous development of Antibody-drug conjugates (ADCs) and the improving needs for precise determination of drug structure, drug characterization technology has also been constantly updated. When the traditional mass spectrometer technology cannot fully meet the demand for precise determination of complex drugs, the technology of non-variable character spectrum (Native MS) has emerged. Native MS has wide application, such as measurement of drug to antibody ratio (DAR) of ADCs. ADCs drugs are divided into two kinds of drugs, which are lysine and cysteine conjugated drugs. Determination of lysine-conjugated drugs is often based on the traditional RPLC/MS technology, and the protein needs to be measured under degeneration condition. However, degeneration condition can result in the separation of heavy and light chains of cysteine-conjugated drugs, thus, cysteine-conjugated drugs must be measured by native MS technology. MtoZ Biolabs has advanced native MS analysis platform, Exactive Plus EMR mass spectrometer and Protein Deconvolution 3.0 software for analyzing native structure of biopharmaceuticals. 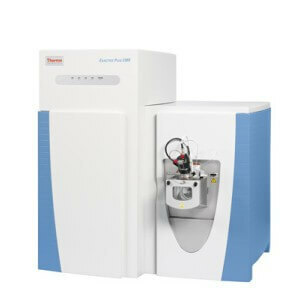 With fast scanning speed, high sensitivity and wide detecting range, Exactive Plus EMR mass spectrometer enables accurate analysis of the structure and topology of protein and protein complexes in native conditions. Other than these advantages, Exactive Plus EMR mass spectrometer also provides the best solution for analyzing peptide and small molecules. •	Sensitivity: detection of nanomolar complex concentrations and analysis of glycosylation of isomers.